Sun-dried tomatoes are one of my favorite ingredients. When I cook with them, I inevitably eat several of them as-is just like they were candy. I just love the sweetness and chewiness of them. I enjoy using them in a variety of dishes and we just love incorporating them into pasta recipes. 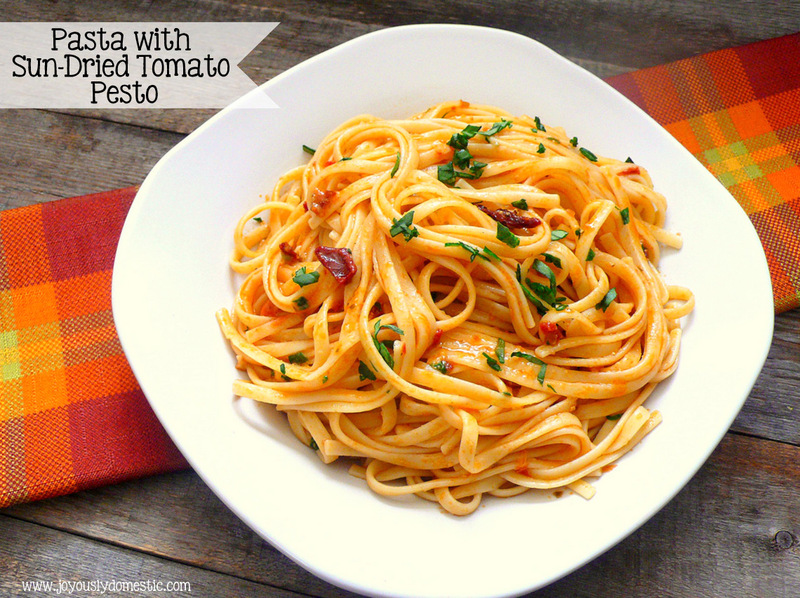 This pasta dish is a fabulous go-to dinner option for us. We enjoy it with a simple salad and some garlic bread. It's a great vegetarian dish to make and is super economical. Cook pasta in heavily salted water to al dente (tender, but still firm to the bite). Reserve about 1 cup of the pasta water. Meanwhile, sauté half of the minced garlic, 4 - 5 of the sun-dried tomatoes (roughly chopped) and the red pepper flakes (if using) over low heat in a large sauté pan. Blend the remaining sun-dried tomatoes (and their oil), the remaining garlic and about 1/2 cup basil in a food processor or blender until the tomatoes are finely chopped. Once pasta is cooked, transfer noodles to the large sauté pan. Add in the pesto mixture and enough of the reserved pasta water to moisten - about 1 cup. Increase heat to medium. Toss to coat noodles. Taste. Season with salt and/or pepper as needed. Serve immediately with freshly grated Parmesan and fresh basil.